On the Moxie Fab World blog they are having a contest this week to create a card with a vintage item. 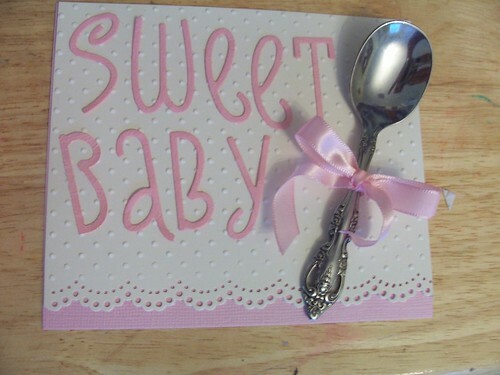 I had found a baby spoon at a garage sale a few weeks ago that I cleaned up and used on this card. Cream paper(Paper Trey Ink), Pink Paper (Bazzil), Vixen die cut letters (Quick Kutz), spoon, ribbon. Thank you so much for commenting on my Paper Crafts Connection blog post today! I hope you get to hug your mom real soon. Your card is very clever...keep on crafting! Did I mention my kids are growing up too fast?